Man's desire to decorate himself with objects of nature like feathers, seeds, and cowrie shells was the initial stage in the development of jewellery. The tribals took great pains to collect these items for their personal decorations. With the advent of the agrarian society, jewellery became associated with the status of a man in society and became a form of savings. In India, jewellery is counted as the wealth of a woman and she inherits it from her father or her husband as gift. Jewellery is mostly associated with married woman in Indian society and a widow hardly displays any form of jewellery. A special community of people called Sonars in India make the jewels. They are attached to specific groups and castes of people. Most of the jewellery items worn by Indian women are the same but for some regional influences. Nose ornaments are widely used throughout India. Different shapes and designs are involved, as also different materials are used in its making. Gold, silver, pearls and a variety of precious stones are used. The nose ornament took shape only in the 10 the century, with the arrival of the Arab invaders. It is of different types like the simple Lavang, clove, to Phuli, the elaborately worked stud, or Nath the nose ring worn in the right nostril and the Bulli the ring worn in the center just over the lips. Bore is a head ornament , which is placed at the parting of the hairs. It is also called as Boldra in Rajasthan, Gujarat and Madhya Pradesh. The tikka is a round pendant at the end of a long chain and which falls on the forehead. It is also commonly used throughout India. Bengal has a range of hair jewels, which decorate the hair tied as a bun at the back. In South India a variety of ornaments are available for decorating the loose plait. A traditional Necklace For the neck there are scores of chains, necklaces, and chokers available. Guluband is made of beads or rectangular pieces of metals strung together with the help of threads. Then there is the longer Kanthi. Under this can be worn a silver chain or a Bead Necklace. Just like decorative chandeliers, these necklaces hang beautifully and make a statement. To adorn the hands there are of course a variety of rings from the cheap silver items to diamond rings, which are worth a fortune. The top of the hand can be adorned with the hathpool or Rattan Chowk. For the wrist there are the Karda, the Paunchi, the Gajira and the Chuda and these all together make up the bracelet category. Bracelets come in cheap mixed metal varieties to diamond studded gold ones. Above the elbow women wear the Bazoo, the Joshan and the Bank. For the hips women wear a series of chain item called the Kandora. Anklets for the toes come in different models of heavy metals and silver. The delicately worked paizebs ending in tinkling silver hollow bells is really a good piece to adorn oneself with. The bichua or scorpion ring for the toe is a symbol for married women. Designs and the mode of techniques vary from region to region and the material used depends upon the status of the wearer in the society. Ornaments range from the simple metal collections to the silver ones, mixed metals, gold, diamond and platinum. The Tribals of Assam patronize silver jewellery but the others use mostly gold items. The patterns are extremely beautiful and they are finely polished. The Thuria earring, which has a most distinctive design of its own in the form of a lotus with a heavy stem, is a common item. It is made of gold and studded with rubies. Necklaces and pendants of other neighboring regions are also common here. In West Bengal, silver and gold jewellery are made. Delicate filigree works are practiced here. Tara Kanta and Pan Kanta are some of the finest pieces of jewellery, which are meant for the hair. The Tara Kantas are pins made in the form of flowers and stars. The Pan Kanta is a betel leaf ornament, which is fixed at the center of the hair bun. In Odisha, the dominant technique employed is that of granulation and filigree. Both gold and silver are patronized. Mainly arm jewels, necklaces, nose rings and anklets are prepared. Finest designs are available for the nose rings. 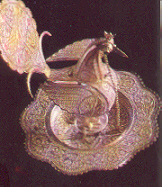 Maurpankhi, one of the designs is shaped like a peacock with open feathers and the whole thing is prepared according to the granulation and filigree technique. Sampangi is another nose ring, which is of the stylized pagoda type from which hangs delicately worked chains each ending in a small pipal leaf. Another peculiar jewel item of this area is the Bank worn on the forearm. This is formed of stiff chains brought together by adjustable links of flowers. Sambalpur is famous for brass jewellery. Delicately worked bangles in different patterns are available but they need regular polishing. Punjab has hair ornaments that are different from the other parts of the country. Here the Tikka is flat and circular with small pendants hanging in the front of the Tikka. In the Kulu region, most of the items are made in Hoshiarpur, which has its own style. The Pipal Patra made out of silver pipal leaves fastened to an enameled piece of silver is commonly worn by the women folk of this area. Here necklaces are formed out of large metal plates, which are engraved with traditional designs and filled with green and yellow enamel. The nose ornaments of this area are highly specialized. The large sized nath and boulak designs of single leaf are specials of this region. Kashmir differs a lot from the other regions in jewellery. The most important designs here are for the ear ornaments. These are known as Kan Balle or Jhumka normally worn by the Muslim women on both the sides of their head. Then comes the common Zululand , a neck jewel item. Engraving and cut works are the important techniques used here. In South India, wearing of silver jewellery is mostly associated with the tribals and the rest resort to gold items only. The Chettinad (in Tamilnadu) jewellery made of uncut rubies is one of the finest. The Addigai is an important neck item also made of uncut rubies set in gold. Mangai Malai, a long necklace made of mango shaped pieces studded with uncut rubies and diamonds is another specialty of this area. Nowadays diamond jewellery has caught the fancy of the South Indian women. The Thalli, a necklace, which is worn during marriage, also has various patterns according to the community of the couple. Kerala has a rich variety of gold designs but precious stones are very rarely used. Necklaces are available in various shapes and designs. The Garuda necklace is famous here. North India is famous for a special form of jewellery called meenakari combined with the Kundan technique. Very delicate stuff are developed using these techniques. First, a basic form of the jewellery is created with hollow spaces allowed for the stones to be inserted. Then the Meenakar fills it with lac and engraves delicate designs on it. Lines are engraved to hold different colors. First the colors, which require the maximum temperature, are filled in and fired. Then the other colors are applied and fired until both the sides are enameled properly. Then the Kundan worker places the stones in their respective area. The piece is then polished with a leather cloth. Different types of jewel items are prepared by this method and Jaipur is the main center specialized in this technique. This art is also practiced in Delhi, Lucknow and Varanasi. In India, the mastery over the mining, smelting and working of metals developed from ancient civilizations. The ancient Indians used to make weapons of defence from the available metals. Over the years the availability of metals increased and shaped vessels were developed gradually for personal kitchen purposes apart from tools and items of armor. 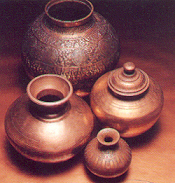 The commonest objects of metal in India are the water vessels. It is the skill of a Metal Smith who makes a water pitcher with a narrow neck and rounded contours to match the curvaceous form of the women folk! The North Indian pitchers have a flat base and a top, which rises, at an angle from the base. The Rajasthani pitcher on the other hand is rounded with a small mouth and a narrow neck, which prevents any spillage of water in the water-thirst desert regions. Another common usage of metal in India is for the temple bells. The bells of India are noted for their depth and purity of tone and also for their designs and shapes. They are made of bell metal, which is considered to be the purest of all metals. It is nowadays also used for making utensils and other ritual vessels. Indians are not much used to utensils of glass, porcelain and wood like the Westerners, so most of the items like cups, saucers, glasses, plates, containers and serving dishes are commonly made in metals. Sheet metal is used commonly in India for preparing water vessels, serving plates, tabletops, dowry boxes, etc. Alternatively heating and hammering the sheet metal make these forms. 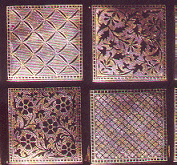 Another important technique of sheet metal in India is the deep repousse work. Here the flat part of the metal is first filled with lac and the basic pattern is drawn. Then the outline is beaten into the lac with the hammer and the area to be depressed is beaten down. The lac is melted and the right side is embedded in lac and the process is reversed. The sections that are to be raised in the final piece are beaten outwards. This process is repeated until the deep repousse work emerges. Finally engraving is done. This method is used in making vessels and images of worship. Madurai, Tiruchi and Tanjore in Tamilnadu, Bombay, Varanasi, and Bhuj in Gujarat are specialties in this technique. Casting of brass and copper is done in Moradabad. Bell metal casting is followed in Kerala, West Bengal, Odisha, Biahr and Assam. First the piece is made in sand or clay and then cast in metal. Another technique of working with metals in India is the combining of two metals. This technique is also called Ganga -Yamuna. Combining of different metals is also done by a method called Damascening where other metals are encrusted into the basic metal. The final works are called Bidar work, Koftagiri, Zarnishan and Tarkashi after the places where they are prepared. Koftagiri is a form of Damascening, an ancient art wherein one metal is encrusted onto another either in the form of wires or small pieces. Originally gold and silver were done on iron and steel defense items. Now this is practiced in Kerala where silver wires are inlaid on iron sheets. Bidri is a method developed in Mysore and it involves the damascening of silver on oxidized black vessels of copper and zinc. It is now practiced in Lucknow and Purnea and Murshidabad in West Bengal. In Zarnishan, silver pieces are first engraved with the pattern and then inlaid. It is also called Zarbuland. Wire patterns are called Tarkashi. Tanjore Plate works, which are very popular throughout India, are also a form of Damascening. Here copper forms the basic metal over which silver medallions carrying repousse designs of Gods and Goddesses and their Vahanas are attached. Brass decorative rosettes are also attached. Enameling is followed in Jaipur, Delhi, Lucknow and Moradabad, where metal is engraved so as to provide depressions in which different colored laces are heated and fixed to create a surface of various colors. 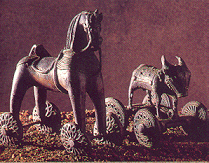 In Bronze casting, the lost wax method is a fine art in India. Many images of worship are made by the process. The images are cast according to the rules laid down by the Shilpa Shastra. In the Lost Wax method, the basic form is first prepared by melting wax and then it is enclosed in clay moulds and fired. The wax melts and a clay mould is created with a hollow space. Then hot molten metal is poured into the mould and then the piece is cooled. The basic solid metal image emerges. Then finer details are engraved on the surface of the body. In South India, Madurai, Swamimalai, Mysore, Bangalore and Karaikal are the important centers practicing this method. Palitana is an important center for casting of Jain images in Gujarat. Varanasi, Mathura, Calcutta, Balasore and Puri are also important metal -casting centers.